Last weekend, my friend invited me to a local pool in an effort to take advantage of the last days of summer. I was excited because I love the idea of having a summer playground in my new home. Of course, that made me even more excited. So I took a tram over to Prague 4 to see this “pool” for myself. 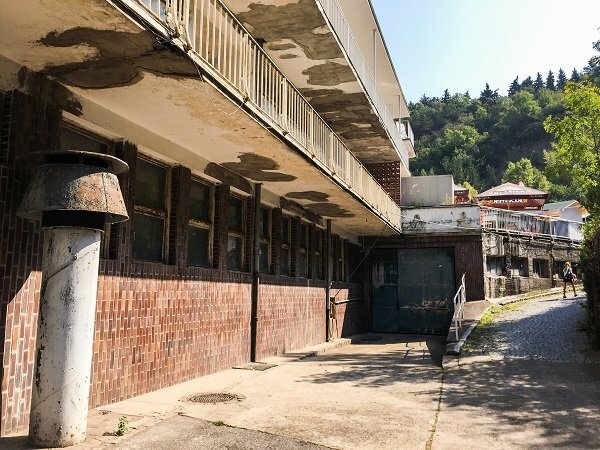 The entrance fee at Podolí is 160 Czech crowns for the whole day, which is around $6. 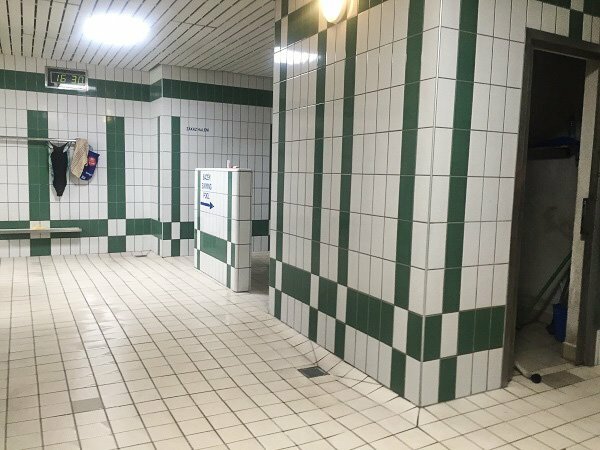 With your pass, you get access to all of the facilities, including the Olympic outdoor and indoor pools, the sauna, and pretty much anywhere else you can find a place to throw a towel and lie down. I was actually pretty impressed, because after her description, I was expecting literally one pool that doubled as a tetanus obstacle course. Instead, I came around the entrance… which, okay… looked pretty Soviet. 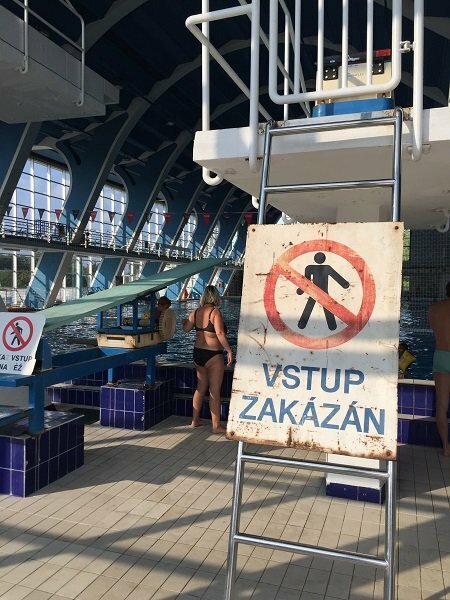 I wasn’t sure if I had accidentally paid to visit a concentration camp instead of a pool. 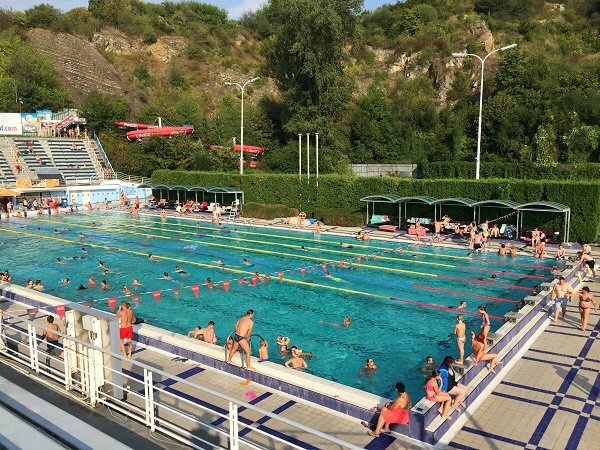 But once you turn the corner, you’re in a beautiful oasis where the Czechs come to enjoy some fun in the sun. 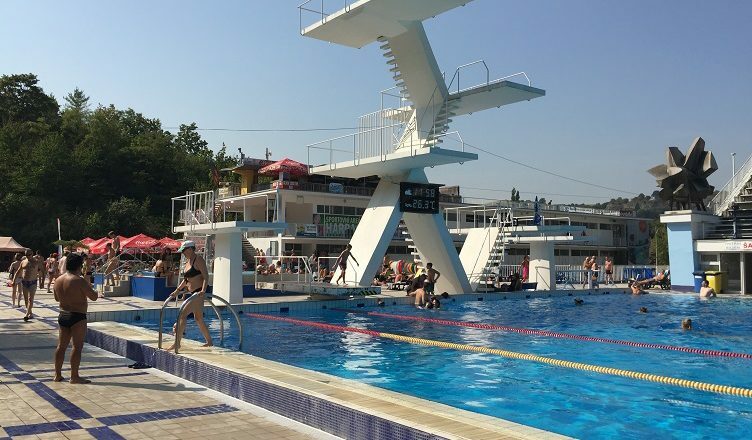 The facility has three outdoor pools, complete with water slides, and diving boards as high as 30 feet in the air. And I use the term diving board fairly loosely because they’re more like concrete slabs. At the far end there’s a giant slide that I’m sure you should enjoy at your own risk. But it looked really fun from the grassy knoll where we sat. 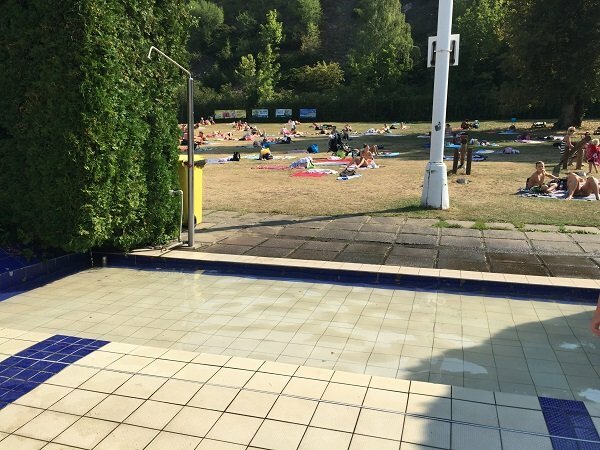 In a brilliant display of functionality, the grassy knoll where people can lay out on towels and hang out is separated from the pool area by large troughs of water. Anywhere there is tile, you can’t wear shoes so when you walk in from the dirt, you’re forced to clean your feet. It’s like a moat to promote pool hygiene. This is also how you get in and out of the bathrooms and showers. So if you don’t have your flip flops handy, the Podolí affords you the unique opportunity of using a public restroom barefoot. So yeah… a little Soviet. 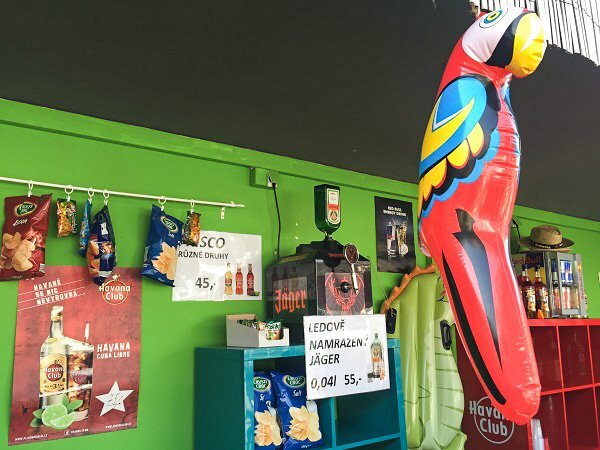 You can get plenty of cheap food and drink at the bar, which is decorated in the style of a tiki bar, complete with fake grass and inflatable tropical animals. It’s one of those charming things about Czech culture. The lines at the bar are long, but they’re worth it. I’m a Cuban from Miami, and for $3 I can now say I’ve had the best mojito in the world at this bar. It’s probably because it’s made with their 1950’s stockpile of Havana Club. It’s nothing fancy. It’s called “Pool Bar” and they also serve paninis and fries. 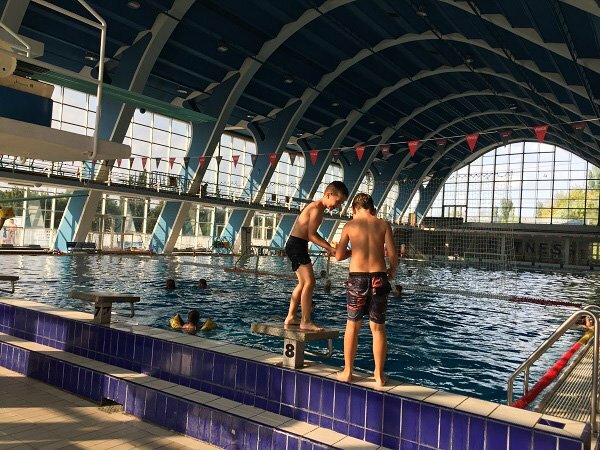 If you’re not in the mood for the sun, you can enjoy the pool inside, which is just almost as big and sits comfortably in what looks like a former airplane hangar. If you look closely, you’ll find even more signs of the city’s humble communist past. But whatever, at least they have real diving boards in there. Sadly, the sauna was closed. 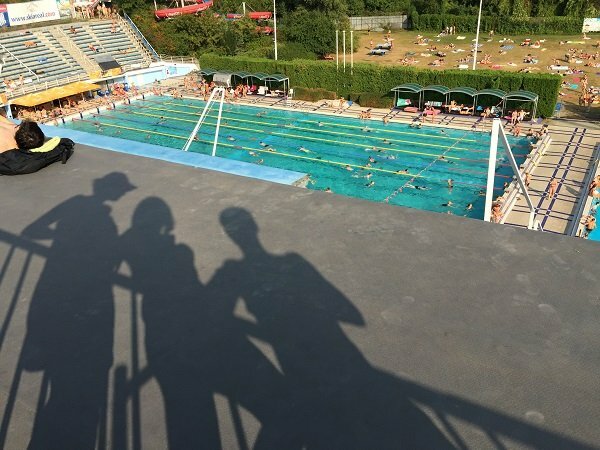 But aesthetics aside, the pool is obviously a popular spot in the summer in Prague. 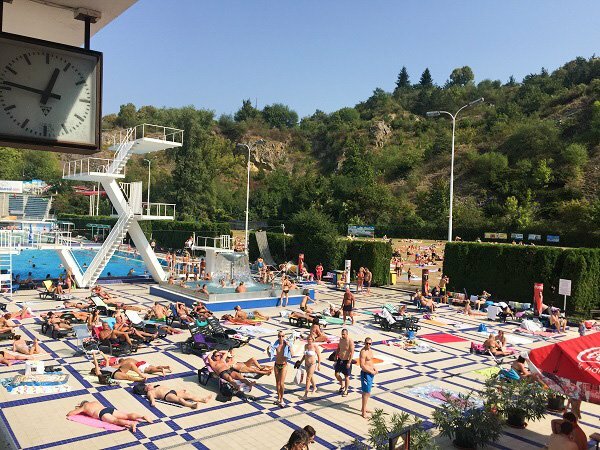 Whether you’re there to practice for Olympic gold, work on your tan, or get drunk and lay in the grass, a good time can be had by all at Podolí.